Lots of pickles have been made, 74 jars total, bread and butter last Saturday, dill yesterday. Jars and jars of pickles that aren’t even pickles yet, because you have to wait for pickles to pickle. With pickles, you learn patience. I like things that teach me patience, I don’t come by it naturally. Gardening taught me a lot about patience. The cycle of life, the growth and the bloom and the setting of seeds, prepraring for the next generation. This is the life of a flower. 84 years is a long time. Long enough to learn about patience. Long enough to come to terms with the cycle of life. Long enough to have lived through the worst thing that can happen, and survive. Long enough to do more than just survive, long enough to relearn how to live. To giggle and to carry on, through endless years of pain, both physical and emotional. To find joy once again. 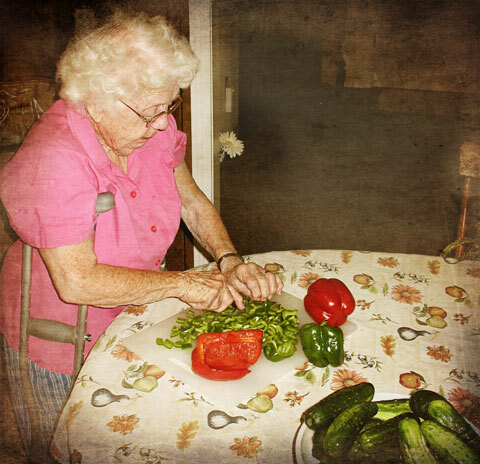 Katie was born with both hips dislocated, 84 years ago, before they knew how to fix such things. Her son, who is just shy of fifty, was born the same way. But by that time, his time, doctors knew to pop his hips back into place just after he was born. Problem solved. And that son, the one just shy of fifty, was Katie’s second son. Her first son, if he were alive, would have been 58 this year. She mentioned this while we made pickles. But her first son is not alive, he died when he was six, in the kind of freak accident that could happen to anyone, at anytime, these things just happen. Only it happened to Katie, who had already, at that point in her life, gone through dozens and dozens of painful surgeries, spent her whole childhood having surgery, her whole life in casts and crutches and wheelchairs. After one of these surgeries, when she was quite young, she was left in a room under lights to dry the cast she was enclosed in from the waist down. But as it turned out, the lights were too hot and the cast started on fire. Katie, at all of four feet, nine inches tall, has the spirit of a giant. Many years ago, when I was sixteen, I dated her son, briefly. That didn’t work out, but my friendship with Katie remained. And then it expanded to include my whole family, until essentially, we adopted her as a grandmother. My parents and Katie and her husband spent a lot of time together years ago, before her husband died. Since then, my parents have taken care of Katie in a million small ways. They are like that. Good people. Her son lives out of state now, my parents and myself are her emergency contacts. But this wasn’t supposed to be a story about Katie, it was supposed to be a story about making pickles. It is hard to tell one without the other. But okay, pickles. My mom and I went to Katie’s and we sliced and we sliced and we sliced some more. Cucumbers, onions, peppers. We put the cucumbers on ice and then we waited three hours for them to crisp. And then later, we simmered but never boiled, and we filled 22 jars, hot jars, hot lids, we wiped their mouths and we tightened down the tops and then, pickles. 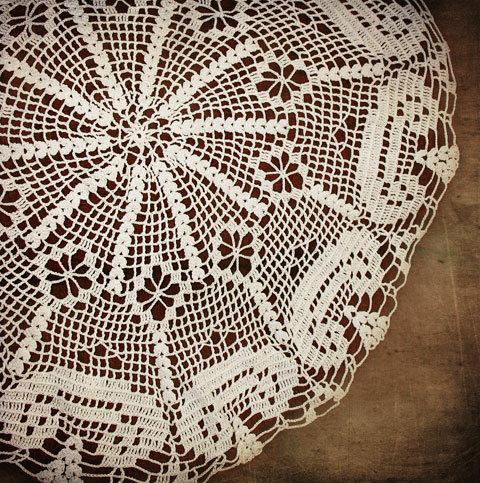 During those three hours of waiting, we talked and we laughed and we listened and we admired Katie’s latest doily, which is amazing. She sits there while she watches baseball (Yankees) and crochets these intricate doilies or she knits mittens, dozens of sets each year, just to give them away. And my mom talked, about her mom and her father, how they used have a huge garden, how they would can everything, even venison. 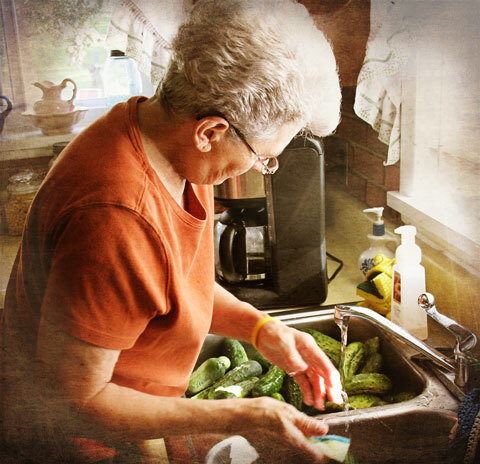 How the smell of the pickles was taking her back to her childhood, which wasn’t the best of times for her, either. And there we were, three women, 84, 68, 47. Almost two hundred years of living between us. But compared to these two women, my life has been simple, easy, a blessing. Through all of this slicing and waiting and simmering and chatting, we giggled. And then I vacuumed Katie’s house and emptied her garbage while she made us egg salad sandwiches for lunch and we ate and talked a little more. The house is getting too hard for her to handle, alone. She is in pain, constant pain, her hip and her spine are literally crumbling. My parent’s house is getting hard for them to navigate, so many stairs. My mom is worried about my dad, her sister, life. And even through all of that, still, we giggled. Katie, who has a million reasons not to giggle, ever, giggles quite a lot. And it makes me smile and laugh, and at the very same time, it breaks my heart, just a little. In the end, when we had finished, there were 22 jars of bread and butter pickles sitting on Katie’s counter. and one whole day’s worth of giggles. The best pickle recipe, ever. p.s. I will tell you about the 52 jars of dill pickles another day. And if you want the bread and butter pickle recipe, I have posted it here. 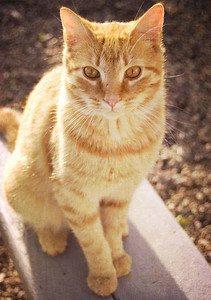 This entry was posted on Sunday, August 8th, 2010 at 11:20 amand is filed under . You can follow any responses to this entry through the RSS 2.0 feed. You can leave a response, or trackback from your own site. aahh, of course. it’s not about the pickles. it’s about the people. the relationships. and the love given ample time to ripen. i know you know you are blessed. This is a really beautiful post. I am amazed at what humans can overcome and have always wondered how mothers cope with losing a child. I hope they have an extra guardian angel holding their hearts tight. you just made me cry. it reminded me of being young, and watching my mom canning pickles. A testimony to the resiliency of spirit..and to life’s frailties. Lucky you to have these ‘elders’ in your life. 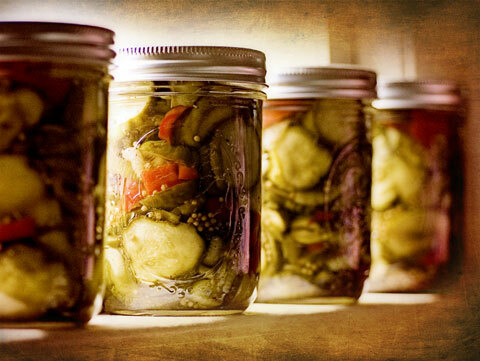 Beautiful story…and amazing job ‘pickling’. Beautiful post, it brought a tear to my eye . . . . it amazes me when people can smile and laugh after enduring so much pain and grief. This is definitely stuff that great memories are made off. my eyes are now moist. i admire that kind of stamina and optimism. she sounds like a great woman. Thank you, Kelly. I love that kind of feminine community~just a day, doing stuff together, but the connections are what build us up, sustain our souls. I have a friend like that, here in my neighborhood; she’s almost 90, still lives alone, drives her own car, dotes on her dog. My hero. I wanna be like that, in my own way, when I am that age. Thank you. I will sound repetitive to everyone else, I know, but there seems to me that there are people among us who are truly champions of the human spirit. They come in various forms, and in different times, who experience life’s tragedies and joys for us, so that we might learn from them. What a blessing for us so that we might be amongst them. a lovely day of giggles and sharing of experiences between three wonderful women. This is a wonderful story and although it shares the struggles in life it is really encouraging. Thank you for sharing your experience with Katie, you made me smile, made me sad and then made me glad! What a beautiful post. It’s moments and activities like these that bind us to the people we have around us now, and those that came before us. When I carry out a tradition that people in my family carried out in the past, I feel connected to them. This was a really uplifting read. this made my heart kind of cry a little cry, but my mouth was smiling, it couldn’t help it, this portrait of life, this tale of pickles – happiness & sadness all in the same jar (forgive me, i couldn’t stop myself – LOL!). so much of this is gone, so much we don’t do together anymore. so wonderful to read this and know those connections are still out there. katie is so blessed to have all of you in her life….and the fact that she giggles often….that reminded me so much of how we still to this day, remember and describe my grandmother…. what a day filled with memories to last a lifetime ! This is such an inspiration to me, and so deeply meaningful. I want to be like Katie: giggling and strong inside, even when my body is failing. Somedays I manage that, somedays I don’t. One of the things I moan about most is that I became an invalid at the age of 24, so young, so very young to be in such debilitating pain. But that is 24 years that Katie did not have, and she is still so spirited and beautiful. So thank you from the bottom of my heart for sharing this, and please give her a big hug from me when you see her next. this day needs to be stored carefully, so that you may revisit if often. I think this is one of my favorite posts ever. What a testament to friendship, perservence, and hope. Fantastic! We’re up to our ears in Cucumbers now too. We’ve done our first batch of Dill (old fashioned in a crock this year), and bread and butter. Have about 12 Quarts completed, and putting more up this evening! So much fun, I love the three generations of women working together! you know, to say i don’t like pickles is a gross, horrid understatement. but i have always enjoyed making them, and this is why. I have just discovered this blog through twitter. What a truly beautiful post. Looking forward to reading more.